The HubSpot CMS is a powerful way to integrate marketing and sales activity with your website. With dynamic personalisation, full funnel reporting and ease of use, it's become the perfect tool for many of our clients. We're a certified Growth Driven Design (GDD) developer and we've written a little guide on how we use HubSpot in web design. If you’re running a business, you’re generally not creating content just for fun. Your content has to entertain, challenge and inform potential prospects, but more importantly it needs to convert interest into revenue. That’s why it’s worth investing in the HubSpot Content Management System if your business regularly creates content. 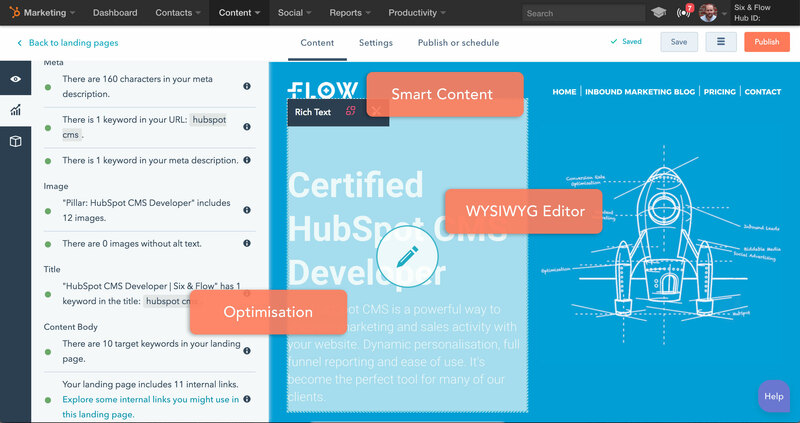 Allow us to introduce you to the HubSpot CMS, part of HubSpot’s marketing software and one of our favourite toys. Why work with Six & Flow? Traditional web design can represent a lot of risk for business owners. GDD approaches builds in a systematic way to reduce costs, meet deadlines and avoid other problems. GDD sites are built to evolve over time, aligning with a brand's overall growth strategy and collecting data to learn about visitors and change the site to suit them. Sales and marketing departments are integrated into the GDD process, both contributing data about existing and potential customers, promoting alignment. Instead of spending months working toward a final product, GDD involves building a launchpad website to enable a swift and uncomplicated initial site launch. Everything we do is tested, improved and tested again. The right stats are vital and we improve GDD sites with constant analysis. 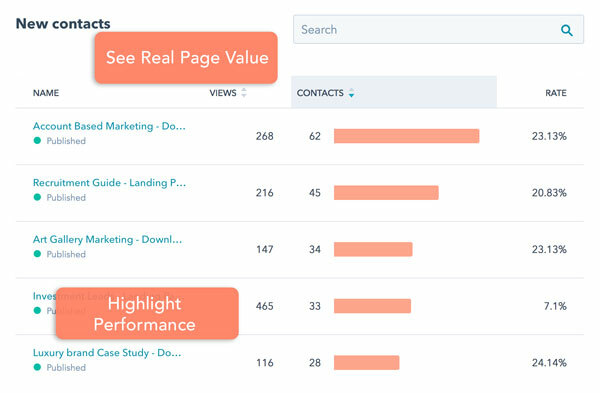 All the data you need is in HubSpot. Ultimately, GDD serves to learn from your website visitors and develop according to their needs. Its web design led by your audience, for your audience. Do you like your website? That’s great if you do! Now, down to the nitty gritty. How much traffic does your website get? How many leads does it introduce to your sales funnel and, more importantly, how many does it convert into sales further along the buyer’s journey? How often is it updated? How many times a week are you able to post a new blog? How many people read it and, if the option is presented to them, leave you their contact details so they can learn more in the future and keep in touch? But hey, as long as the website looks nice, right? Well, no. This is one of the largest misconceptions held by businesses today. They need a website that looks attractive, but also attracts new customers and leads on a regular basis, converts sales and keeps people coming back for more. At the very least, your website should be a marketing tool. When it works properly, which is what growth driven design (GDD) aims to provide, it should generate more high-quality leads and convert sales on a consistent basis, improve brand perception and increase its reach. Why is traditional web design broken? Think back to when you had your website built and you may begin to see what we mean about the traditional web design process being broken. Where you ever asked any of the above questions, for instance? If they were discussed did you have to prompt the conversation and were your concerns addressed properly? We believe that the traditional web design process is broken for numerous reasons. One of the most important is objectivity; what looks like a great website may knock your socks off visually, but it may also have some serious usability issues. So many businesses get sold a website on looks alone, when what they need is an all-action online front-of-house that’s a cornerstone to their overall growth ambitions and marketing strategy. It can be an expensive process: Traditional web design projects can run into tens of thousands of pounds. Depending on your schedule you could pay in instalments, but however you choose to pay, the fee will almost always need to be paid in full before your site goes live. It’s time-consuming: Designing a website is a hugely technical and complex process, especially the more bespoke you want your site to be. It can take months to complete, and also demands time and resources from members of your team as it evolves and takes shape. The design process evolves: The online marketing sphere and consumer habits are continually changing, meaning there’s no guarantee that what was agreed before the project may be at the cutting-edge of web design once it’s completed. Naturally too, as projects aren’t typically set in stone, timeframes and budgets could change . The final product may be lacking: Again, objectivity. There aren’t any test runs when it comes to the traditional web design process; what you see at the end is usually what you get. How people use and react to it will be the final product you’ve paid for. 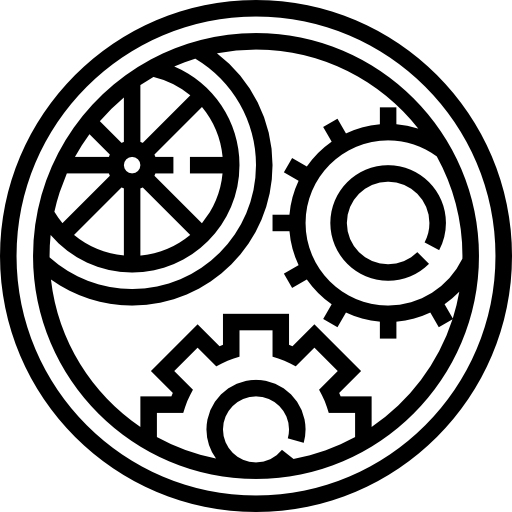 Changes, updates and overhauls will be a separate project entirely, leading to more investment and delays. In short, you may be left with a flashy but impractical website. We believe there’s another way to do it though - through growth driven design. GDD isn’t just a way to build effective websites. It’s an entire philosophy, using cutting-edge data insights and other methodology to build a website that’s not only attractive, but evolves with your users’ online habits and your business strategy over time. Once those ideas, wants and needs have been identified it’s time to build a launchpad; a site in its most basic form that is still able to deliver your core message, products and more to the people who matter most to your long-term growth. As soon as the site is launched, you’re already collecting lead information, data and feedback in transparent, ethical and organic ways to build upon for the future. No more months spent updating a website on a design hunch. Instead your website is built and optimised to the wants and needs of the people who matter to you most, attracting better leads as you go, converting sales, enhancing your overall growth and marketing strategies, and more that the traditional web design model simply can’t provide to the modern business. Like most things in your marketing plan, you’re more likely to get to where you want to be more quickly if you plan a proper strategy. 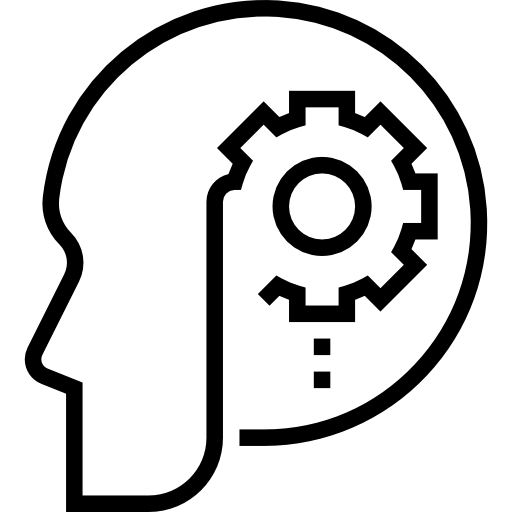 GDD helps to take assumptions and objectivity out of the equation, and helps brands to get to know their personas and the problems they face more accurately. Minimising risk: The issues with traditional web design represent a lot of risk for business owners. A GDD philosophy helps to negate a lot of these risks by approaching builds in a systematic way to reduce costs, avoid late deliveries and many other common problems. Constant evolution: Instead of spending months working toward a final product, GDD sites are built with the explicit intent of evolving over time, aligning with a company’s overall growth strategy and using key data to learn about visitors and change the site to suit their needs. Aligning departments: This philosophy helps to optimise website performance and also works to better align sales and marketing departments. Both departments are integrated into the GDD process, both contributing key data about existing and potential customers. 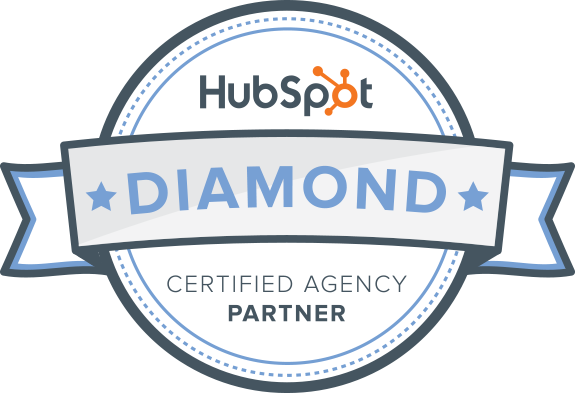 So, what does a HubSpot web design agency do? We build great sites and user experiences across the HubSpot CMS. Using personalisation, integrated sales and marketing, there's a lot of potential to grow your brand. 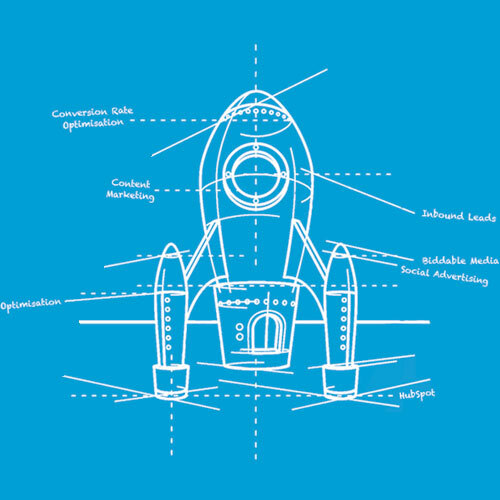 Growth Driven Design (GDD) is easy to use and a perfect companion to your inbound marketing efforts. Why not have a free call with one of our consultants to see if the HubSpot CMS will fit your needs. Just pick a date and time below and we'll call you then.